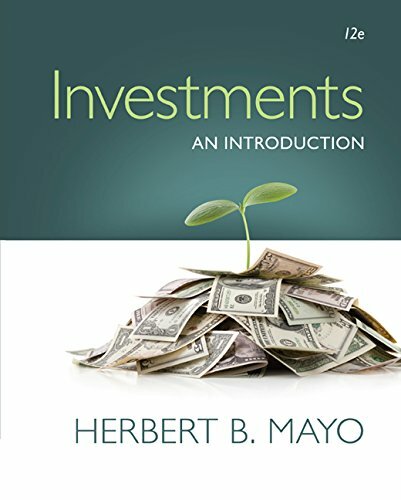 1305638417 -Mayo’s INVESTMENTS: AN INTRODUCTION, 12E allows you to fully understand today’s most important investment topics from the perspective of an individual financial planner. This edition provides an inviting, comprehensive approach to investments–from the fundamentals you need for success on the CFP exam to more advanced skills for investing today. You’ll learn the key points of making solid investment decisions as you gain an overview of today’s most pertinent investment opportunities and challenges. An ongoing Financial Advisor’s Investment Case, Internet assignments, and expanded coverage of stock valuation ratios as well as stock repurchases and dividend payments emphasize how you can apply what you’re learning to daily decisions.